Optos Photography - Warson Optics: Providing Quality Eye Care for Over 30 Years! At Warson Optics we care about your eye health. That's why we are now offering optional Optos Image screenings for our patients. 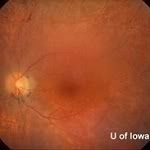 By taking high-resolution pictures inside the eye, we can use a digital imaging system to record a detailed photo of the retina. 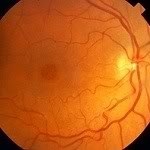 Retinal photography assists in the detection and management of conditions such as macular degeneration, hypertensive retinopathy, optic nerve disease, diabetic changes, and retinal holes or thinning. Everyone can benefit from this simple screening. It is especially important for people with a history of high blood pressure, floaters, diabetes, headaches, retinal diseases, flashing lights, or a strong glasses prescription. 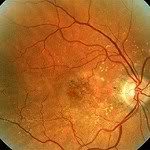 Retinal photography screening is quick and painless and provides an excellent baseline reference point for future comparisons. There is a nominal charge for this screening. 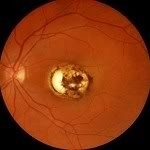 Below are actual examples of just some of the eye health conditions that can be detected by this screening.